The current recycling rate has already added 16 years to the 70-year life expectancy of the landfill. Continue reading @ AJC. New subscribers still need to contact the sanitation department to be added to the pick-up (404-294-2900 or sanitation@co.dekalb.ga.us). For additional information on DeKalb's recycling program see the County's recycling brochure (pdf file). 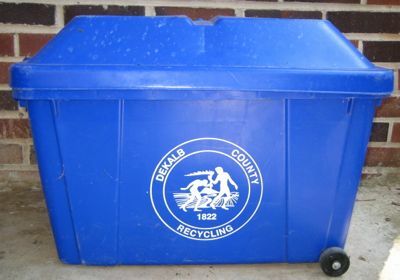 The County accepts all grades of paper (from plain to glossy, from junk mail to phone books to cardboard), all glass, and CLEAN plastic containers (coded 1-7). Pick-up is on Wednesdays.